Taylor Sheridan knows how to tell a cohesive, intricately crafted story. Sheridan proved that with 2015 and 2016’s critically acclaimed Oscar nominated films, Sicario and Hell or High Water. And now with 2017’s Wind River, Sheridan demonstrates he’s just as adept at directing as he is at weaving a complex tale on a page. Sheridan’s Sicario, Hell or High Water, and Wind River are populated with fascinating characters who exist in worlds not necessarily familiar to the average audience. 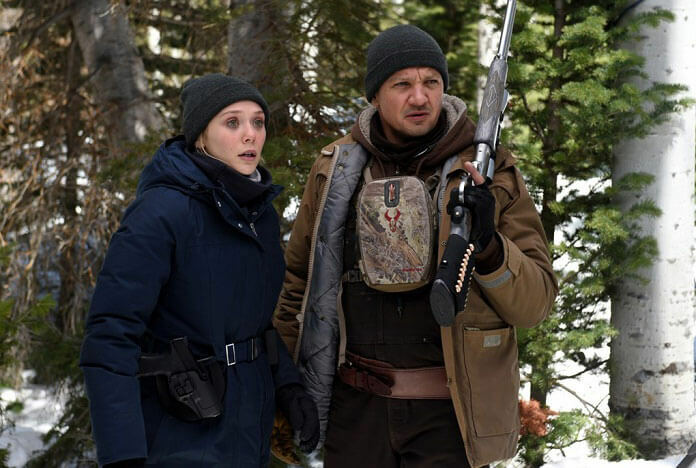 In the case of Wind River, the intriguing, flawed characters are brought to life by Jeremy Renner (The Hurt Locker, The Avengers), Elizabeth Olsen (Godzilla, and also The Avengers), Graham Greene (Longmire), Gil Birmingham (Sheridan’s Hell or High Water), and Jon Bernthal (Baby Driver). Wind River follows Wyoming tracker Cory Lambert (Jeremy Renner) who’s recruited into the search for the murderer of a young Native American woman after he finds her corpse in the snow while he’s hunting mountain lions. His skill set makes him an indispensable resource to the fish-out-of-water FBI agent tasked with overseeing the investigation on the Wind River Indian Reservation. Agent Jane Banner (Elizabeth Olsen) is ill-equipped to deal with not only the inhospitable weather conditions but also the tribe members involved in the case either as family members of the deceased or potential suspects. As Wind River unfolds, backstories are carefully revealed and the tension ramps up, reaching a brutal climax. Sheridan’s exceptional script gives each member of the talented ensemble special moments to shine. As with his other work, Sheridan’s written real, believable, genuine characters who act and react as real humans would in stressful and frightening situations. He’s also provided enough lighter moments within Wind River to ease the tension back slightly, in particular through Graham Greene’s reservation sheriff character. As he’s previously demonstrated, Sheridan understands how to get into the skin of a long-time law enforcement professional and has infused Greene’s character with a sharp wit. Sheridan doesn’t pad his script with unnecessary twists or red herrings, and instead moves steadily through the film with the focus kept on the murder mystery. It’s worth noting that where a less self-assured screenwriter most likely would have slipped in a romantic storyline, Sheridan steers completely clear of that clichéd trap. Jeremy Renner and Elizabeth Olsen have never been better onscreen, and the entire supporting cast is terrific. Wind River is smart, original, and solidifies the emergence of a talented filmmaker who understands how to connect with and treat an audience. Sheridan’s films aren’t light fare and he paints in the grey area more so than either black or white, but he never cheats and never lets the audience down.